I adore needlework competitions even though I never find the time to participate in them. You may recall the A Mirror To My Art competition and the Chatelaine de Vergy competition that I told you about previously from which came some truly beautiful needlework. 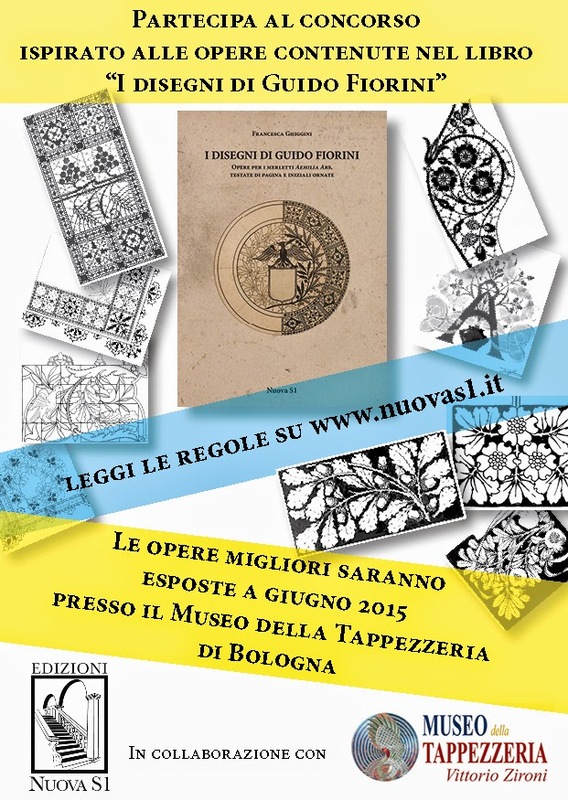 The Museo della Tappezzeria Vittorio Zironi and the publishing house Nuova S1 of Bologna, Italy announce a needlework competition which will produce some breathtaking works, I am sure! They have recently collaborated with a book release and museum exhibition of the designs of Guido Fiorini, an early 20th century Bolognese artist and key figure in the "Liberty" (Art Nouveau) style which runs through to the end of July 2015 - if you can get there, go! Those of you who know a little of your Liberty history will know that Liberty + Bologna = Aemilia Ars! Under the direction of the Countess Lina Cavazza of the Aemilia Ars Society, Guido Fiorini made many lace designs like the one shown above. For Italian speakers, the needlework competition rules can be found here. For English speakers, I have translated them below. Please let me know if you are entering a piece in the contest! Worth a note: if you are a registered participant, you are entitled to a 15% discount off the purchase of any publication from Nuova S1! They now accept PayPal. Create and exhibit at the museum! Participate in the "Drawings of Guido Fiorini" competition! On the site and on the Facebook page Merletti e Ricami della Nuova S1 the following initiative takes place, realized in collaboration with the Museo della Tappezzeria Vittorio Zironi of Bologna: a competition, open to the techniques of embroidery, lace, knitting and weaving inspired by the Drawings of Guido Fiorini. The competition is free and takes place online: the prize for the works with the most votes is that they will be exhibited at the Museo della Tappezzeria alongside the Fiorini works. Read the rules and participate! You can exhibit your work twice! First online and than at the museum! 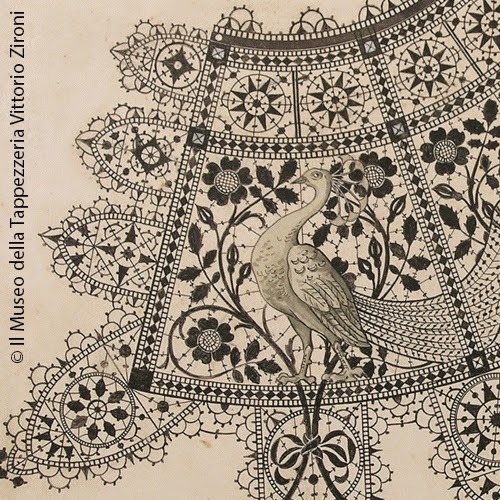 The publishing house Nuova S1, in collaboration with the Museo della Tappezzeria Vittorio Zironi, organizes a competition of embroidery and lace based on the drawings contained in the publication: "I Disegni di Guido Fiorini" with the aim of setting off new works of this 20th century artist. The competition is open to all, amateurs and professionals with no age limit. 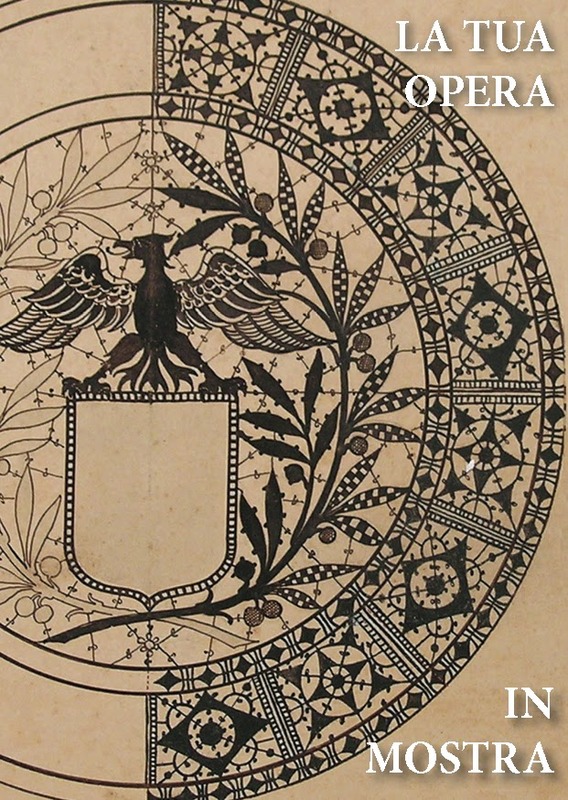 Participate by reproducing a work from the publication "The Drawings of Guido Fiorini, works for Aemilia Ars lace, page headers and ornate initials" (Nuova S1, 2014). Only one work per person is to be submitted. Measurements are open to a maximum of 20 cm x 20 cm. Not only Aemilia Ars lace! Your work can be realized in any technique of lace, embroidery, knitting or weaving. To register, send an email to: info@nuovas1.it or telephone: 051-346050 by and no later than December 23, 2014. Subsequently, photos of finished works will be sent to info@nuovas1.it by and no later than April 20, 2015. The works with the most "likes" on Facebook will be exhibited at the Museo della Tappezzeria Vittorio Zironi in Bologna. The organizers of the competition reserve the right to periodically supervise the conduct of voting. Voting will be closed by May 15, 2015. Registered participants are entitled to a 15% discount on the purchase one or more of the titles from the Edizioni Nuova S1 catalogue. Winning works will be sent via tracked mail to: Nuova S1 snc di Pietro Cimmino & C., Via Albertazzi, no. 6/5, 40137, Bologna, Italy. Works will only be returned to those who explicitly request it. The organization, while ensuring the utmost care of the works, declines all responsibility for loss, theft and damage. The authors of the works, by the very fact of participating in the competition, give the right to publication without any claims of copyright. The artistic property will always remain that of the author. The organization reserves the right use the works to organize exhibitions, paper and/or electronic publications including online and other initiatives without owing anything to the author, who will always be credited by name. Each author is responsible for the works submitted and, with their submission, authorizes its publication and gives permission to the organization to be able to manage fully and exclusively the work itself, under current regulations on the protection of privacy and confidentiality. Under the provisions of Law 196/03 (law on the protection of personal data), the participation in the competition implies the unconditional acceptance of these rules. Note One: Do not wait until the last minute to register! If the required minimum of entrants is not received by December 23, 1014, the competition will be cancelled. Note Two: Send in a photo of your work as soon as it is finished! The sooner you do, the sooner it will be published allowing for the maximum visibility of your work. Italian Needlework assumes no responsibility as to the accuracy of the above translation and shall not be held responsible for errors in translation.